15th Annual Rubber Ducky Festival, Free Community Festival Coming in October! The 15th Annual Rubber Ducky Festival will take place on Saturday, October 14, 2017 from 11 a.m. – 2 p.m. at Bridgeport Park in Valencia. 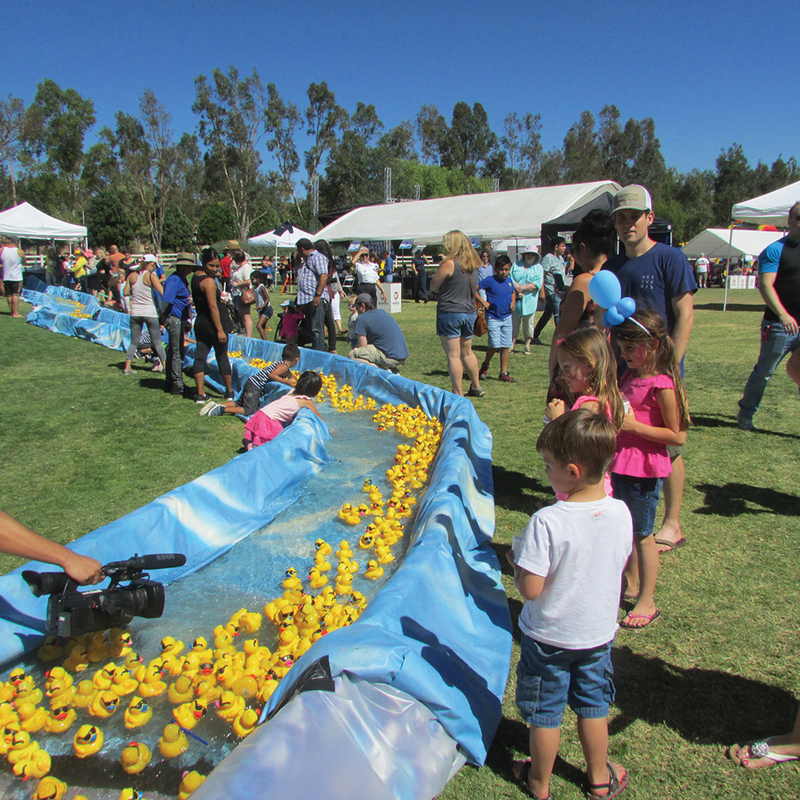 The FREE, family festival kicks off at 11:00 a.m. Several races will occur throughout the day, with approximately 5,000 rubber ducks racing to compete for one of the Grand prizes of $2,500, $1,500 and $500. Local vendors and non-profit community partners help make up the event, which also presents a stage program filled with local children’s talent and performers. A “Kid Zone” area takes up the center of the event, complete with a rock climbing wall, face-painting, balloon artists, air bouncer, games, activities, and an appearance from the Los Angeles County Fire Department’s “Shakey Quakey” house. All rubber ducks entered in the races are available for adoption at $5 per duck, $25 for a Quack Family (5 ducks plus 1 free duck); $50 for a Quacker’s Dozen (10 ducks plus 2 free ducks) and $100 for a Duck Flock (20 ducks plus 4 free ducks). Online adoptions are now open at duckrace.com/scv. SDFHC is honored to have Supervisor Kathryn Barger as the Honorary Chairperson of the event, with community partner Alan Ferdman in the role of Chairman for the Rubber Ducky Planning Committee. All proceeds from this event go toward patient care services at SDFHC, which offers affordable, quality, primary healthcare, dental and mental health services for residents of the Santa Clarita Valley. SDFHC, in collaboration with the City of Santa Clarita, will use the water to irrigate the fields after the event. SDFHC thanks our sponsors of the event: The Henry Mayo Newhall Foundation, Santa Clarita Valley Rotary Club, Mission Valley Bank, McKesson Corporation, Henry Mayo Newhall Memorial Hospital, Burrtec Industries, and Kiwanis Club of Glendale. Media partners and sponsors for this year’s event include: KHTS AM 1220, elite Magazine, and The Magazine of Santa Clarita. For more information about becoming a sponsor, adoption fundraising teams, performing, volunteering, or being involved in the event, please contact Katie at SDFHC, Katie@sdfhc.org.